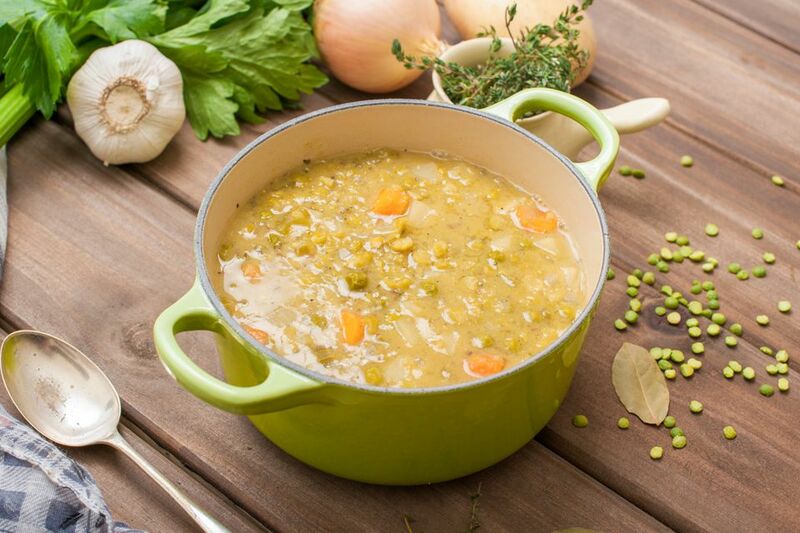 Need a meat-free and fat-free split pea soup recipe? Although many split pea soup recipes use ham for added flavor, this vegetarian and vegan split pea soup packs in the spices, including thyme, sage, and bay leaves for a lower fat and cholesterol version of classic split pea soup. As an added bonus, with all those herbs and spices, you'll find that you need very little salt to add the flavor, making this a good vegetarian choice for those on a low-salt or reduced-salt diet too (though check your bouillon cubes, as those can be high in sodium). With no added oil, this soup is fat-free and very low-calorie, with less than 250 calories per serving. If you think that's awesome, you might also want to check out these 8 fat-free and vegan soup recipes. Need it to be gluten-free? Omit the bouillon cubes and use a gluten-free vegetable broth or make your own at home so you know exactly what is going into it. Here's our most popular basic homemade vegetable broth recipe. Soup is always an easy choice to make in a crock pot, but slow cookers are really amazing. You've probably thought about trying out a vegetable soup or a vegetable chili in the crock pot, but you really can make everything from vegetarian rice dishes to vegetarian baked beans and even an Indian Vegetable Curry. Can't get enough homemade vegetarian and vegan soup recipes? Check out some of the most popular vegetarian and vegan soup recipes on The Spruce. Or, want to try some more simple, easy, healthy and homemade vegetarian recipes? Get some quick, simple and familiar vegetarian dinner ideas to try tonight. Place the split peas, vegetable broth, and bouillon cubes in your Crock-Pot or slow cooker and give it a quick stir to break up the bouillon cubes a bit. Cover and cook on your Crock-Pot's low setting for at least 4 hours, or until the green split peas are soft.